One hundred luminous blue stars are suspended in the triangular grove of trees in Memorial Park right next to Hemenway’s restaurant. Beneath the beautiful blue stars are hundreds of Luminaria candle lanterns flickering on the lawn. 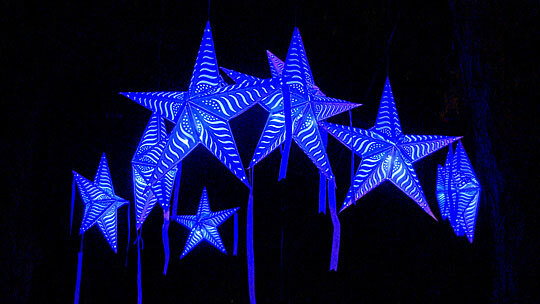 Add your light to the night and wish upon a star in the Starry, Starry Night installation in exchange for a $10 donation. Write your wish on a white ribbon and attach it to your own luminous blue star, which you can hang amongst the trees in the constellation overhead for all to view and enjoy. For a $5 donation you can dedicate a luminaria candle lantern. 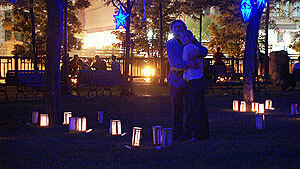 You can also take a beautiful star – and the magic of WaterFire – home with you for $30. Please join us by making a wish and adding your light to the night. Evans created Starry, Starry Night in response to a challenge from Alan Hassenfeld, a long-time supporter and donor to WaterFire – whose passion for art and making the world a better place knows no bounds. Hassenfeld challenged Barnaby to come up with a new artwork at WaterFire that would inspire people to dream and work for a better world, and at the same time encourage people to donate directly to WaterFire by including them in a special celebration. 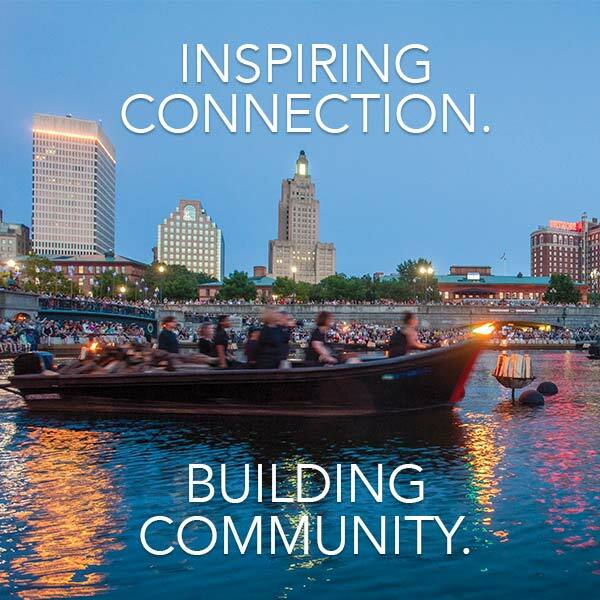 Hassenfeld sees WaterFire as an important feature of the Rhode Island community and hopes visitors will contribute to WaterFire and commit themselves to bettering our world. This new feature in Memorial Park is a perfect place for people to join together as a part of WaterFire’s new CELEBRATE program, where you can mark all the special moments of your life. WaterFire is a celebration of community and we are dedicated to inspiring the city of Providence. *Starry, Starry Night is weather dependent and the Star Field will not be on display if the forecast calls for rain.